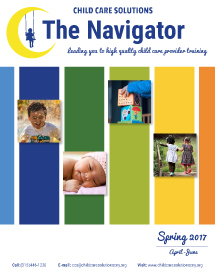 "The Navigator"a quarterly training catalog that contains current training information and offerings for the child care providers of Central New York. "Connection" a bi-monthly newsletter for child care providers, parents and community members who care about early care and learning systems in CNY. We are working hard to bring you a brand new version of “Connection” our monthly newsletter – look out for the first edition in early summer 2017! "Parent Guide to Finding High Quality Child Care" walks parents step by step through the process of finding and choosing high quality child care.